Games at weddings are becoming more and more popular. When I first became a celebrant I performed a themed and costumed Alice in Wonderland Wedding. I came as the white rabbit from the story. 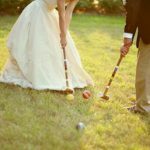 During the break after the ceremony and before the Reception, guests played croquet on the lawn, like they did in the story itself. They all seemed to really enjoy the theme and the croquet. You don’t have to have a theme to have some fun and games at your wedding. If you want to be hip with the in crowd, here are some tips for a successful fun wedding that everyone will be talking about for ages afterwards. 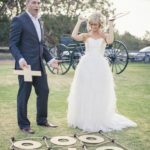 So many ceremonies happen outdoors in parks and gardens these days and even in people’s home gardens, that it is really perfect to set up some games to give the guests something to do if there is a break between the ceremony and the reception times. It also discourages so much alcohol drinking, so could save you a bundle. You can provide water and soft drinks in eskies or tubs of ice during the break. Let the champagne flow after the bridal party arrive back to the celebrations. 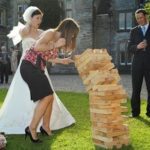 There are a few ways to acquire the necessary games you need to keep the guests entertained while you have photos taken etc. Firstly keep in mind what type of wedding you are having. If the look is very formal, some more refined games would be required. Croquet or Boules would be very suitable. 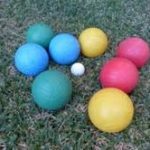 You can buy boules and croquet sets that are not too expensive and keep them later for home parties in your own garden. If you keep your eye on the catalogues you can find these games on special from time to time. They last forever, so can be a great investment. I also had friends who made their own giant jenga. They said it wasn’t too hard. 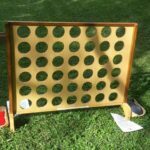 Look on pinterest for information on making giant games. I ordered giant games online, which included giant jenga (very popular) and giant connect 4, also a popular game. There was also a giant dominoes. The quality of the games when they arrived was quite disappointing, the giant connect 4 falling to pieces before my party was over. This was a big shame. I had attended a party where the giant games were absolutely fantastic. On enquiry, my friend informed me that she had hired these games for her party. Another fantastic game is Giant frisbee, but this perhaps is a little athletic for a wedding. Guests may have to take off their good shoes and heels to play this. So if you do care that your guests are having a great time and not just drinking the bar dry in between ceremony and reception, start buying or look at some of the following websites to see prices to hire games. Then put one of your friends or family members in charge of putting the games out and collecting them to be taken back after the wedding. If you are game for the games for your big event, try the following websites. Have an excellent wedding and if you want a fantastic celebrant who is lots of fun, contact us. Creating Moments to Cherish Forever!